An 18-month-old child wakes from her nap with a very hoarse cough and difficulty breathing. On examination, you note a runny nose and a slight fever of 38.8º C. The respiratory rate is 32 breaths/min and the skin colour is good. She makes a harsh sound on inspiration and her cry is slightly hoarse. Both parents have colds. You make the correct diagnosis of croup or laryngotracheobronchitis. 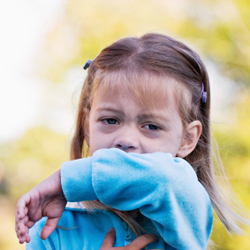 Croup occurs frequently in the winter months in Canada. Though it affects about 3% of children under age 6, only 1% of these ever require hospitalization.1 The distress results from an inflammatory response to a viral respiratory tract infection, due to the small size of the airways. The cough in croup is practically pathognomonic for the disease, but the differential diagnosis includes a foreign body, and more ominously, epiglottitis. More accurately named supraglottitis, it’s become much rarer with the advent of immunization against Haemophilus influenzae type b (Hib). Croup, on the other hand, affects the glottis and subglottis. Other entities to consider, especially in an older child, are retropharyngeal cellulitis or abscess and peritonsillar abscess. In general, croup is a relatively benign condition requiring mainly reassurance. Suggest adequate fluids and antipyretics for fever > 38.5º C — but hold all cough syrups, as these are never indicated. Many experienced physicians recommend a cold mist or hot mist humidifier or cooling the child’s room down slightly. During a cough episode, the parents may bundle the child up and step outdoors for 15-20 minutes to relieve some of the upper airway obstruction. Alternatively, going into the bathroom and steaming it up is often helpful. Although there’s no strong evidence that these measures shorten the course of the illness, they appear to provide some symptomatic relief (if not for the child, then for the parent). The literature does support giving a single dose of oral dexamethasone (0.6 mg/kg).1 Nebulized budesonide has also been used with success in moderate to severe croup.2 (I’ve used 500 μg successfully.) More intensive treatment is rarely required. The clinical course is usually 3-7 days with gradual diminution of the symptoms, but a dry cough and slight hoarseness may persist for another few days. Remind the parents that the upper airway obstruction in croup almost never results in severe or complete obstruction requiring intubation, unlike epiglottitis, which is thankfully infrequent. Warning signs of the latter are the age of the child — usually older, drooling and inability to swallow secretions, a chin-forward position to maintain airway patency and an apprehensive facial expression. A suspicion of epiglottitis requires immediate emergency treatment in the hospital with colleagues from otolaryngology and anesthesia. Bjornson CL et al. NEJM 2004;351(13):1306-13. Griffin S et al. Br J Gen Pract 2000;50(451):135-41.